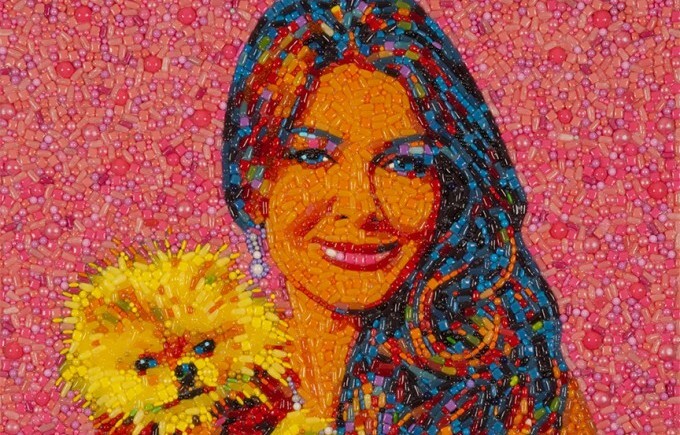 Portraits of Hollywood stars made from pieces of sugary and sweet candies! Candylebrity, a new series of portraits created by mosaic and collage artist Jason Mecier. Jason is famous for his one of a kind style of creating portraits out of outrageous materials such as: food, junk, discarded objects, pills, and candies. He collects the trash that he uses for his artworks and some are celebrities own discarded objects. In Candylebrity, Jason came up with a new series of mosaic portraits (out of Gummy Bears, Candy Corns, Hot Tamale) inspired by Hollywood pop culture figures. From ladies like Lisa Vanderpump, Big Ang, and Miley Cyrus to James Franco, Breaking Bad characters Walter and Jesse, and Zach Galifianakis. Jason’s work has been featured on The New York Times, Entertainment Weekly, TV shows like TMZ and Glee, as well as on a music video by Pink. Candylebrity will be shown in Sweet! Hollywood from June 25 to September 25, 2014. Check out more of Jason Mecier’s outlandish artworks on his portfolio.